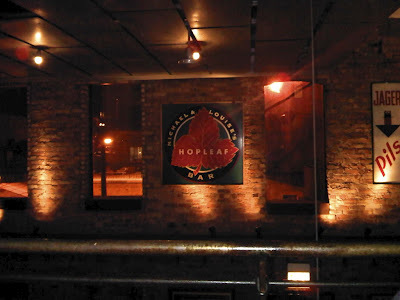 I actually first heard of Hopleaf from my cousin Jung when he came to visit me this past summer. He was looking online for some good bars that we could try and Hopleaf was on his list. It's up in Uptown so it was a bit far out of the way for us, but Gook found out about a monthly storytelling event that they have on the second floor. On the 2nd Tuesday of every month at 7:30 pm on the second floor of Hopleaf, featured writers and performers share intimate, personal stories from their every day lives. We thought it sounded like a fun thing to check out so we all made the drive up there after work one week. The problem was that you can't have food in that room, so we were confronted with the choice between listen to the storytelling thing, which goes for about 2 hours or so and then eat afterwards or eat first and then go into the storytelling thing afterwards. You can probably guess what we decided to do. :) By the time we were done with dinner, we caught the second half of the program. They have a ridiculous selection of draft beers and bottled beers. My cousin would go nuts if he were here. I tried their Avec Les Bon Voeux, which translates with best wishes in French. It was described as "a touch of honey sweetness, grassiness, a bit of hop bitterness, some of the distinctive Dupont yeasty funk & a nearly perfect amount of spritz. 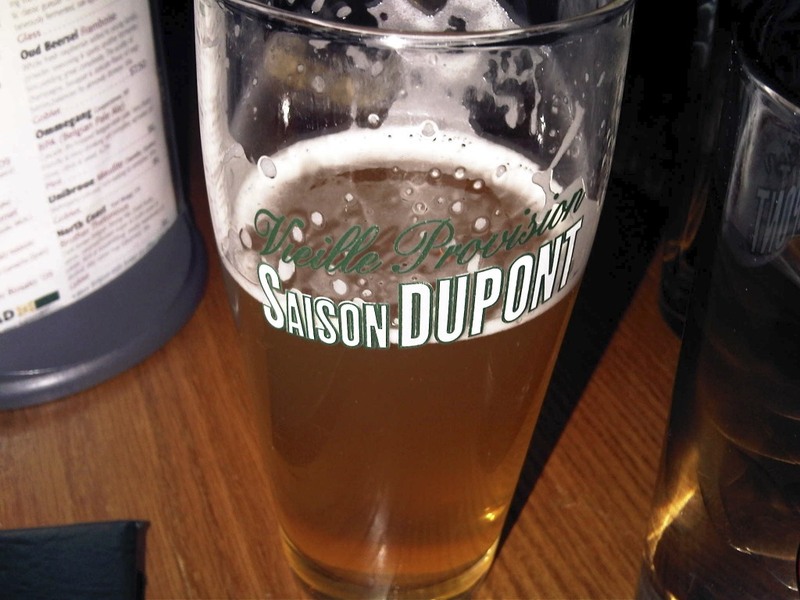 A perfect beer." I am by no means a beer connoisseur, but it tasted good to me. We started off with an order of mussels. You have two choices: belgian style, which is with white ale, shallots, celery and bayleaf or steamed in white wine, with sweet & spicy chorizo, caramelized onions and pepadew peppers. We went with the second choice. Sorry I forgot to take pictures, but they were awesome. 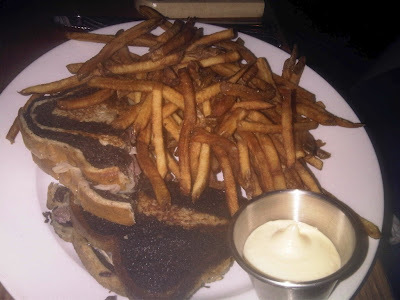 They came with frites and aioli. 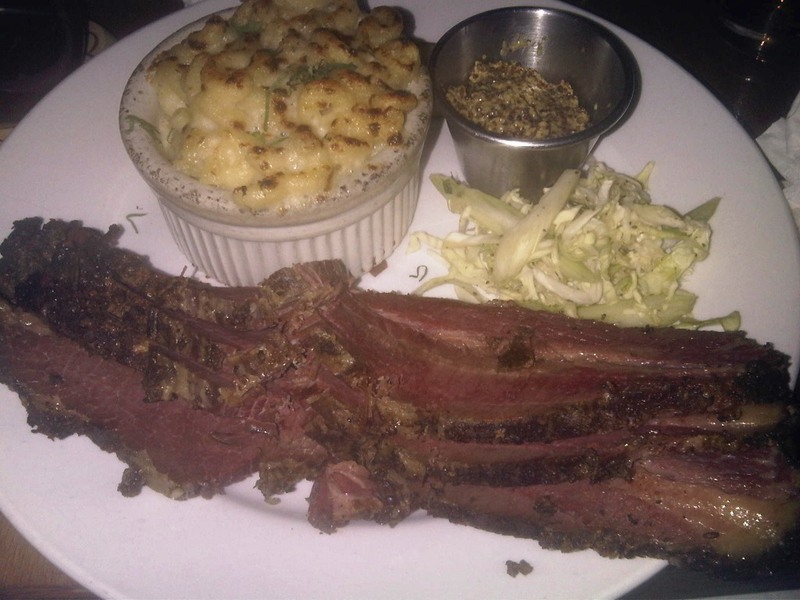 For our entrees, I ordered the Organic Montreal-Style Brisket Platter. It came with a couple slices of brisket, dill pickle, cole slaw and a ramekin of stilton mac & cheese. It was a bit meat-centric for my liking, but I have no idea why I even ordered this. It must have been the beer talking. Susan and Gook got the Duck Rueben, which had Pekin duck breast, slow-roasted with cranberry cream cheese spread, house-made sauerkraut and emmenthaler, a type of cheese. I stole of bite from Susan's. It's an eclectic combination, but it totally works. Aleen got the CB&J, which was a cashew butter, fig jam and morbier cheese sandwich. 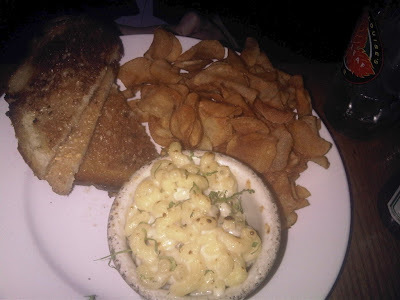 It came with stilton macaroni-and-cheese & house-made potato chips. This is a really cool bar with a great beer selection and food options. The mussels and the duck rueben are a must.